Percy started my second wine tour off with a short drive out of Hermanus and up Rotary Way, a road that heads up onto the peaks of the surrounding mountains and that from the top gives a marvellously scenic panoramic view of Hermanus, Walkers Bay ocean and the Hemel-en-Aarde wine valley. It was yet another sunny day, with only a few clouds in an otherwise blue sky. From the top of Rotary Way a number of whales could be seen, although from that distance I was most appreciative of the binoculars that Percy not surprisingly had to hand for me to view them at play. After soaking in the view we drove back down and then headed out into the Hemel-en-Aarde valley to sample some wine. First stop Newton Johnson, that had a total of 7 different wines to sip. Percy’s wine knowledge is impressive too, as he informs me of all sorts of interesting facts about South African wines, how it is made, oak barrels, corks and many wine related topics. He also places onto the counter a container that has water biscuits in it. These he informs me are for me to nibble on between each wine sampled, as this has a palate cleansing effect and therefore my palate is not tainted between each wine sampled. In Percy’s hand he also has the wine bible, the John Platter wine guide of South Africa, which he reads to me their take on each wine and how they describe and rate each one that I am tasting. Newton Johnsons winery is positioned on a high hillside and offers a jaw-dropping view of the Babylon Mountains and the vast fertile farming valley between the mountain range and myself. To my left and in the far distance is the coastline and the Hangklip peninsular. The smell of lunches being served arouses my nose and I look around the wine tasting counter to see the lovely restaurant of Heaven. Very aptly named I thought. With a wine tour it is important to keep track of what you have tasted, as one never knows when a beautiful wine might jump out at you. To this end Percy insists that I arm myself with a list of the wines on offer at each winery and a pen, so that I can start to do my own scoring of each wine savoured. Wine tasting, I soon discover, is a very personal thing, as we all have such varied taste buds and it could be that one wine might be delicious to one person, but utterly distasteful to another. 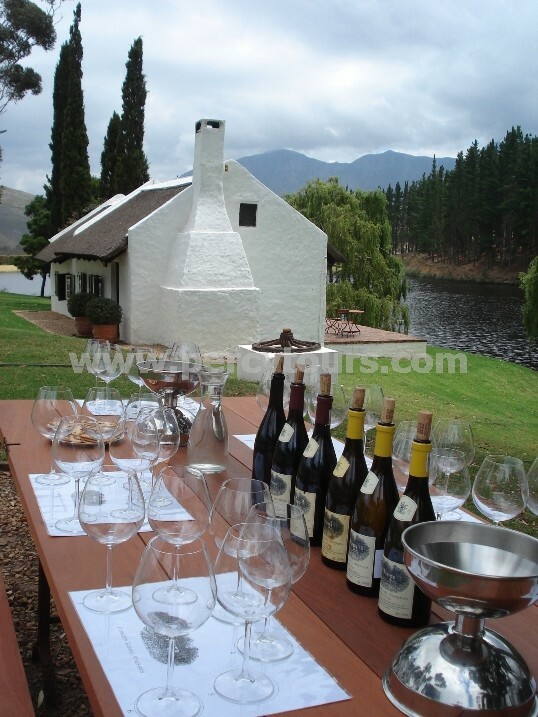 We slowly descend the valley, stopping at Sumaridge, Bouchard Finlayson, Hamilton Russell and ending at the aptly named Wine Village, where astonishingly they have over 1,600 different wines from the Western Cape. 4 hours later I am happily smiling and slightly tipsy and am also jolly glad that I am not driving. My completed lists of wines sampled my score card informs me which were the wines that I disliked and more importantly, which wines it were that I totally loved. I feel much more confident that I can go into any restaurant in the world now with a little bit more knowledge of what to order with my next meal. Early evening I took a walk along the Hermanus sea front, I was getting used to spotting the whales by now and in the late afternoon sun there were many to be seen. Overlooking the wall down onto the rocks a few feet below I stopped to join a group of other tourists who were watching a colony of Rock Hyrax (or Dassies) jumping in, out and over the rocks. Rock Hyrax are quite common in the area and I had seen them in a number of places that we had previously stopped. They are small furry mammals, like an oversized guinea pig or a rabbit that had been on a MacDonald’s supersize me diet, well since they were busy scurrying around probably not the latter. In our ad-hoc group one of the ladies leaned over the wall and with an outstretched arm offered some food to one of them that we could see was contemplating the unexpected prospect of some food. From out of nowhere came a loud booming voice, "Don't do that it will have your hand off". The hidden military style command continued, "They look cute but they will RIP your arm off". Like a message from above high, with every word and every syllable extenuated the message from the unseen voice was quickly heeded and as a group we all took a little step back and decided to keep our distance from the playful and seemingly cute furry mammals. This rude and alarming utterance was not thankfully from Percy, as he was too busy watching and photographing Kayakers paddling in Walker Bay some 40 metres away. He was however very entertained to hear my silly story. I'm not an extreme sports fanatic, I don't seek danger or need to get a buzz out of dicing with death. I wasn't too sure then why I had signed up for the micro-light flight. The model aircraft Percy wanted me to get into looked a flimsy affair – a light-weight metal frame covered in canvass. I couldn't see any onboard entertainment and could see no way that the air hostess was ever going to get the trolley up to serve me drinks and light snacks. I thought I was expected to fly the thing myself and was relieved to meet John who was to be my pilot, I then felt concerned that I was going to be expected to sit on the wing or his lap, but lucky for me it turned out there was a back seat after all and once John had strapped me in and given me a pair of Mickey Mouse like ear headphones, I felt I probably looked silly but I was more secure. More secure that was until the engine was fired up and we taxied down the runway, although it wasn't long before I was able to swap apprehension for exhilaration as before I had time to think about who I should leave my house to in my will, we had left terra firma and were soaring up and away towards the blue sky. The noise and the wind and with John’s reassuring commentary in my ears the experience was fantastic. 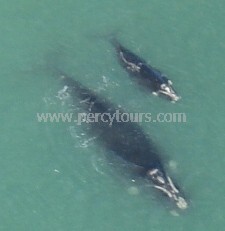 It was only a few minutes before we were heading out over the sea and being treated to a birds-eye view of whales in the bay including a mother and baby. Air travel is common place these days but when cocooned inside a passenger jet the shear exhilaration of flight is somewhat lost. The micro-light with its bumpy ride as it finds clean air, the continual rush of wind and the noise from its tiny engine makes you appreciate flying and I was rewarded in every direction as I looked at views to savour. As my concerns diminished and my confidence grew I began to enjoy the flight more and more so much so that when it came time to land I was sad it was all over and wanted to do it all again. Please click our Articles Main Menu Page to view our extensive library of South Africa tourism related Articles and Things to See and Do.